Dramatic vistas, open spaces, unique desert wildlife, a lodge made from desert sand bags. 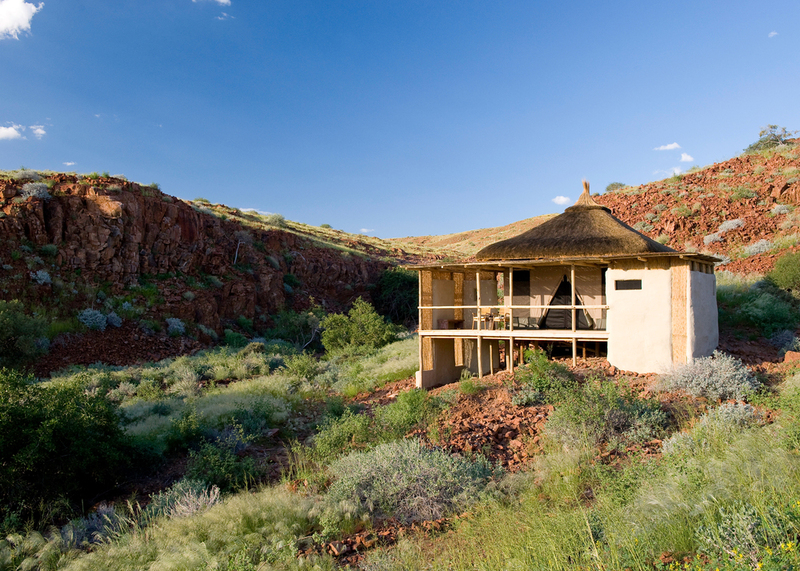 Damaraland Camp is situated in the Torra Conservancy – a benchmark community partnership – with sensational views of the surrounding desert plains, ancient valleys and distant peaks of the Brandberg Mountains of Namibia. Here the ancient rock petroglyphs can be enjoyed from the humble tented safari lodge built to celebrate this UNESCO World Heritage Site. 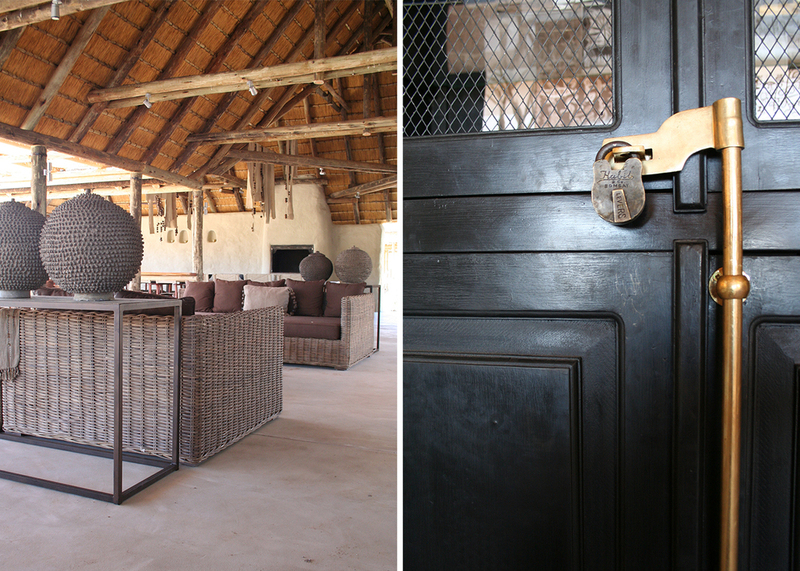 The harsh environment was sensitively researched so the lodge is both site specific and uses age-old, local building know-how, ensuring its undeniable authenticity. In addition it’s an entirely green concept with a very light footprint and significant energy innovations. 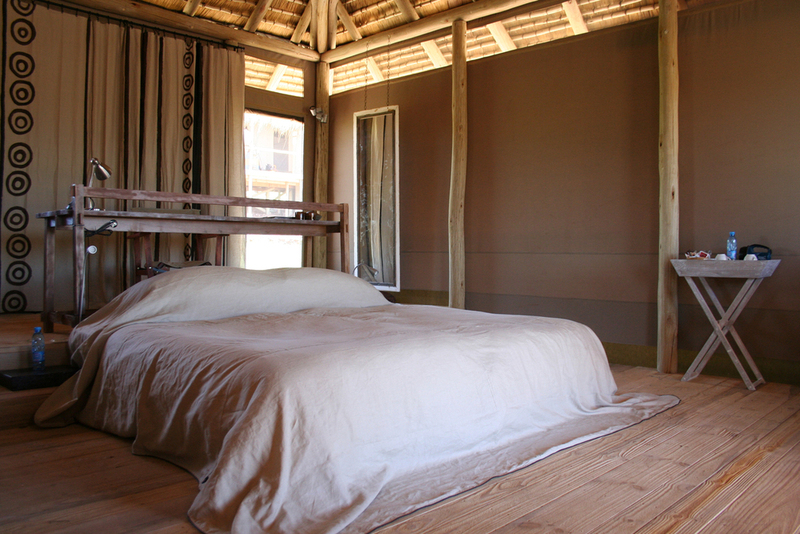 No steel and very limited man-made materials were used in the buildings, only sustainably sourced, natural, bio-degradable materials – sand-bag adobe walls, sand-blasted timber floors, canvas fabric sandwich walls, river reed screens, endemic, organic gum poles, grassland thatch roofs – all borne from the land. We asked ourselves, ’what do we have here in abundance?” Well, space and sand. So the 'blinker walls' made of eco-sandbags create adobe buildings, with gum poles to give them structure and thatch roofing to thermally insulate and visually integrate them with the surrounding landscape. Mostly open, the canvas roll-up walls blur the boundaries between outside and in, with the adobe walls critically providing protection against the south- easterly winds. The result is a place that celebrates frugality and finds elegance in it. New technology blends with ancient construction methods to create innovative, eco-friendly luxury in the desert, within the camp’s 10 elevated adobe-styled, thatched units. A spacious, communal living area is complete with a fireplace, bar, and organic swimming pool. The interiors reflect a monochromatic signature palette drawn entirely from the natural surroundings and the famous ancient rock carvings in the vicinity. An open campfire and outdoor 'boma' with deep barazza seats can be enjoyed during calm star-gazing nights together with the staggering view of families of endangered, desert-adapted elephant. This is the architecturalisation of nature, or the naturalisation of architecture..